Although Winter (and Spring) are my favourite times of year, winter really is a tough season for our skin. The first and most important step of any good skincare routine is cleansing and it’s a step that should never be overlooked. It’s the foundation of any beauty ritual, not only do cleansers whip away impurities, they also impact the subsequent skincare steps. After all no moisturiser or serum can fully work to its maximum potential if it’s being applied to skin with clogged pores or remnants of grime. Cleansing is an integral part of our skincare routine because it helps to remove oil, dirt and make-up, as well as pollution, debris and dead skin cells. Cleansers come in many different forms to suit a huge variety of different skin types and some of the most effective and most nourishing cleansers for winter skin are Oil, Gel and Cream cleansers. Oil Cleansing is undoubtedly the secret to fully removing pollutants, make-up or excess grime. Sebum, our skin’s natural oil, is lipid (oil) soluble therefore sebum (the oil in our skin and pores that can get clogged up and lead to acne) is best removed with a lipid-soluble cleanser. So because oil dissolves oil a formula like the award winning Pinks Boutique Hydrating Deep Cleanse Melt – £40.00 at www.pinksboutique.co.uk – is an ideal cleansing choice this winter season for those who wear make-up. Oil cleansers are generally in the form of a paste, balm or melt and when you massage the product into your skin the action of massage alone triggers lymphatic drainage. Ingredients to look for in oil cleanser products include Vitamin E or oils high in tocopherols like organic Raspberry Oil. Olive Squalane deeply conditions and protects skin, organic Prickly Pear Seed Oil and Safflower oil are fabulous for skin prone to breakouts. Try also looking for products containing Jojoba oil and Babassu oil for more combination skin types. clogged pores and remove excess oils without stripping the skin. Gel cleansers are ideal for deep cleaning without over-stripping. However a note of caution, your face should never feel tight and squeaky after using a gel cleanser, if it does the cleanser could be too powerful for your skin type. 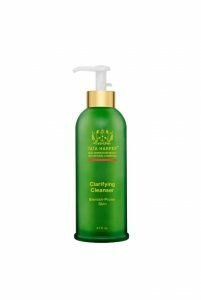 Try the Tata Harper Clarifying Cleanser renown for its effective but gentle cleansing from www.cultbeauty.co.uk £59.00 with free shipping. Ingredients to look for in cream or gel cleanser products include Vitamin C, Vitamin B5 such as Panthenol, Alpha Hydroxy Acids (AHA), Glycolic Acid and antibacterial ingredients such as Tea Tree Oil or Witch Hazel. nourished clearer complexion this season.